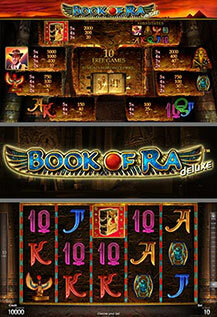 Awaken the ancient mysteries and majesties of Egypt with "Book of Ra™". This 5-line and 5-reel game will take you on an adventure through ancient Egypt. Discover the "Book of Ra™" to enter the action packed feature and unveil the long lost treasures of the Pharaohs. BOOK OF RA substitutes all symbols except the Feature symbol in the Feature games. 3 or more BOOK OF RA trigger 10 Feature games, and open to randomly reveal a special expanding symbol that expands to cover all three positions on the respective reels and pays on any position. Feature games can be re-triggered.